Yesware Templates is a core feature that many of our users rely on because it saves them time (and money). With templates users can store and quickly use the most consistent messaging so they don’t wastes time copy/ pasting. The Yesware compose toolbar contains your template library in five categories specially designed for sales people. They include Prospecting, Pipeline, Objections and Support. *Note: If you are on a team then all templates are automatically viewable by your team manager unless you have them in the ‘Personal’ category. When you click on a category then you can easily create a new template by clicking ‘New’ or using your current email message by selecting ‘Save as Template’. You can edit templates within the Compose Toolbar allowing for use of all Rich Text, but no HTML or images. Rich text gives you the ability to use common font modifications like bold, italics and hyperlinks. If you put text inside [brackets] it will display in red when you click ‘Use’ so you can quickly customize your message. Earlier this summer we rolled out a new feature in templates called Reply Rates. This displays the Reply Rate percentage of each of your templates so you can see which of your templates is getting the most replies. These are typically the ones most people share with their team as well. 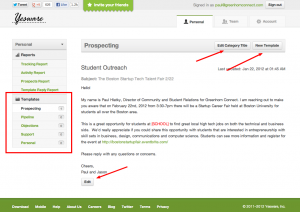 You can share templates with your team by clicking ‘Share’ on any template. You will then see a pop up that will ask you to indicate who you’d like to share it with. You can share it with your whole team, certain members or others that you’d like to include. If you go to Yesware at the top of your Gmail toolbar you’ll be able to choose ‘My Yesware’ which brings you to our application. *Note: If you’re the team manager you’ll be able to review and share templates there as well. Under ‘Templates’ you can find the list of your templates and categories. Here you’ll be able to edit the Category titles and templates which will then be reflected in your Gmail. 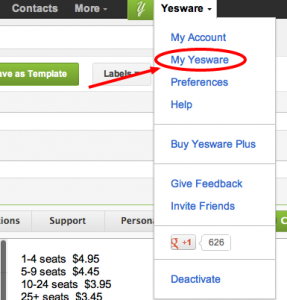 Utilizing the Yesware template library appropriately has become a real asset to many of our users. It saves them time and makes the entire sales process more efficient. We’re always looking for ways to improve Templates and other features. If you have any ideas or questions please let us know in the comments!